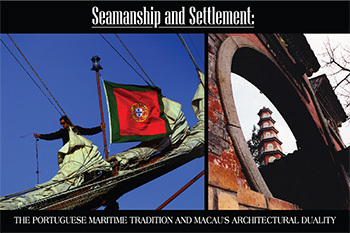 Linked Exhibitions of Photographs and Images of the Portuguese Navy’s Tall Ship N.R.P Sagres, and the Historic Architecture of Macau, China. This exhibition has been extended through July 10th! Join us to celebrate some 500 years of Portuguese maritime skill, daring exploration, and mutual cultural influence with China as exemplified by magnificent photographs of the N.R.P. Sagres, which has roamed the world’s oceans as the Portugues Navy’s school ship, and of the historic architecture of the port city of Macau, the first enduring point of contact between China and the West. Sponsored by the Old China Hands Archives, Oviatt Library, California State University Northridge, the International Institute of Macau, the Lusitano Club of California, the Macau Arts Culture and Heritage Institute U.S.A. and the Friends of the Oviatt Library. Parking $6.00. For information call (818) 677-2638. Persons with disabilities needing assistance and deaf and hard of hearing persons needing interpreters, please call in advance for arrangements.